Last summer, I found out that I was out of propane about ten minutes before friends were coming over to barbecue. Ooops! I pulled out my cast iron skillet to cook the steaks and received skeptical looks. If the barbecue is the sacred alter of a man's world, my method of cooking the steaks was probably sacrilegious. ;) After the steaks were devoured, the guys admitted that they would like to have steak prepared like that again! Cast iron skillets are fairly inexpensive, and they last forever. The heavyweight cast iron transfers and retains high heat without any problems, and you can go from stove to oven without any problems. As an added health benefit, cooking in a cast iron skill will add trace amounts of iron to your diet. Because a cast iron skillet holds onto heat well, it is great for searing meat. Since BBQ season is not here, whip out your cast iron skillet for some steaks! My perfect steak starts by bringing the steak to room temperature. This allows the steak to cook evenly. After about an hour, I will heat about half a stick of butter with some olive oil in the cast iron skillet. By adding a little bit of olive oil, this brings the smoke point up so that the butter does not burn. While the butter melts, I preheat the oven to 450ºF and season the steaks with Kosher salt and freshly ground black pepper. Once the butter has melted and the skillet is sizzling hot, I add the steaks. At this point, you will hear sizzling, and that sizzling sound means that it is searing and locking in all of the juices. After about two minutes, I will flip the steaks so that they can sear on the other side. Because I prefer my steaks more rare, I do not cook them very long; however, please modify to your preferences. After the steak has been seared on both sides with a nice crust, I'll add just a thin slice of butter to the top of each steak and put the skillet, with the steaks, into the oven for just a few minutes. Once the steaks are done, allow them to rest for 5 to 10 minutes. This allows the juices to redistribute throughout the steak. This method produces the perfect medium-rare steak with a nice crust on the outside. Add some potatoes and a salad, and you have a delicious, impressive meal in less than an hour! About an hour before you begin cooking, remove the steaks from the refrigerator and allow them to reach room temperature. Over medium heat, heat half a stick of butter with olive oil. As the butter melts, preheat the oven to 450ºF. 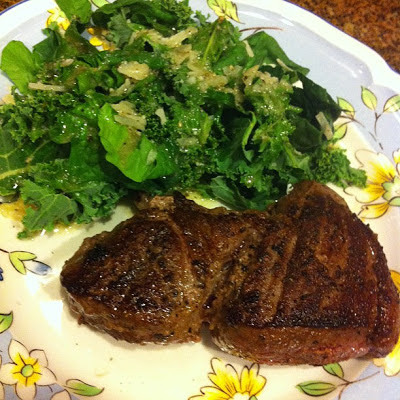 Once the butter has melted and the skillet is sizzling, season the steaks with salt and pepper and add to skillet. After two minutes (please cook longer if you prefer a more cooked steak), flip the steaks to sear evenly. After the steak has been seared and has developed a nice crust, add a thin slice of butter to the top of each steak. Put the skillet containing the steaks into the oven for a few minutes (please cook longer if you prefer a more cooked steak). When the steaks are done, allow them to rest for 5 to 10 minutes. Serve with desired sides, and enjoy! We had steak cooked this way tonight. Yum. My only difference was I used a rub on them first. Your steak looks perfect and delicious. I love cooking my steaks on a cast iron too. That crust is perfect on the outside and creates so much flavor. :) Love it.